Leave the bustle of the big city behind, and head for the coast: this half-day, private tour makes it simple to explore another side of Taiwan. 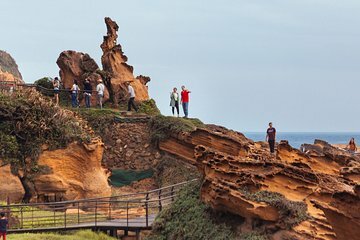 Head first to Yehliu National Geopark, where you can admire the unique rock formations and coastal views. Then, continue to the local town of Jinshan. Stroll down Jinshan’s Old Street and sample treats from its food vendors, or enjoy a seafood lunch (own expense). Finish your visit with a trip to the Cihu Temple or the Ju Ming Museum.